January 14, 2018: More snow? Forecast: Partly to occasionally mostly cloudy. Cold. 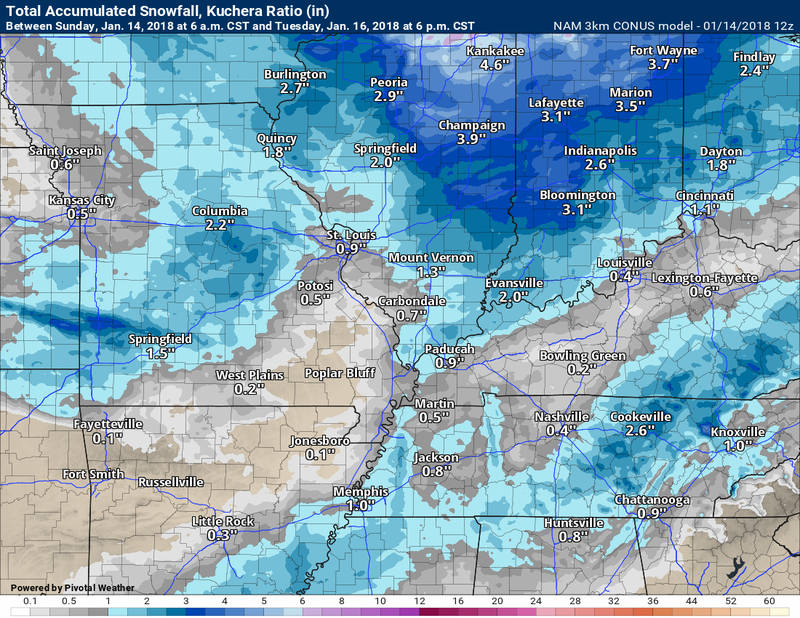 Snow flurries or snow showers possible, especially over southeast Missouri, northern parts of southern Illinois, and perhaps northwest Kentucky. Less than one inch accumulation. Coverage of precipitation: Spotty snow showers possible. Wind chill values: -8 to 8 above during the morning. 10 to 20 during the afternoon. Forecast: Quite a few clouds. Snow flurries possible. 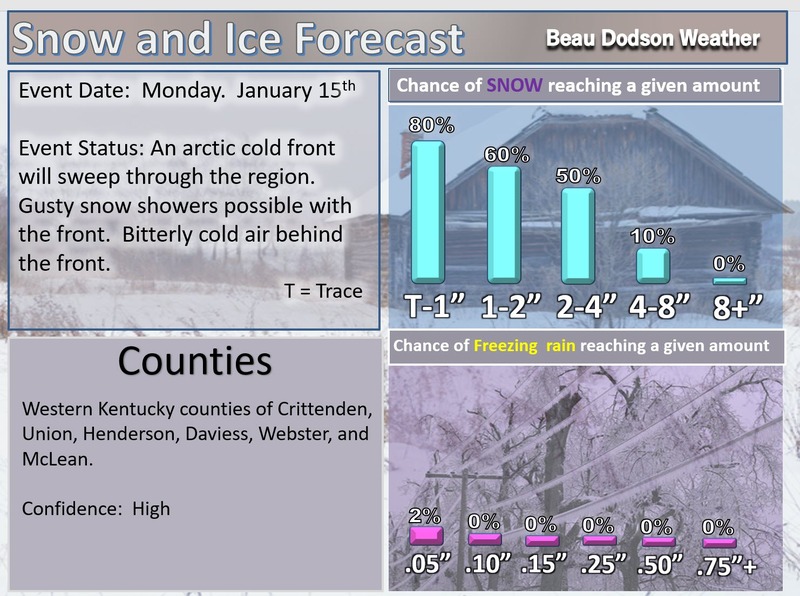 Winter weather alert Monday morning into Monday evening. Snow likely. Forecast: Increasing clouds. Cold. A band of snow developing from the north. 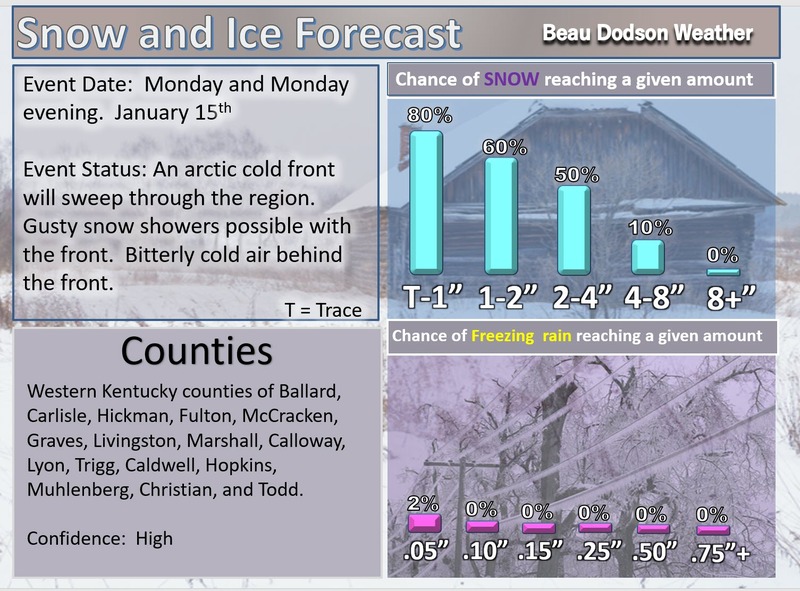 Snow may be mixed with sleet or rain near the KY/TN border and across the Missouri Bootheel. Light accumulation of a dusting to three inches. Coverage of precipitation: A band of precipitation moving north to south. Accumulating snow or ice: Yes. A dusting to three inches of snow will be possible. What impacts are anticipated from the weather? Icy roads possible. Blowing snow possible late. Winter weather alert for the evening hours. Snow possible early (mainly over our southern counties). Forecast: Cloudy with snow showers possible. Bitterly cold. Blowing snow possible. Coverage of precipitation: Scattered mainly early. 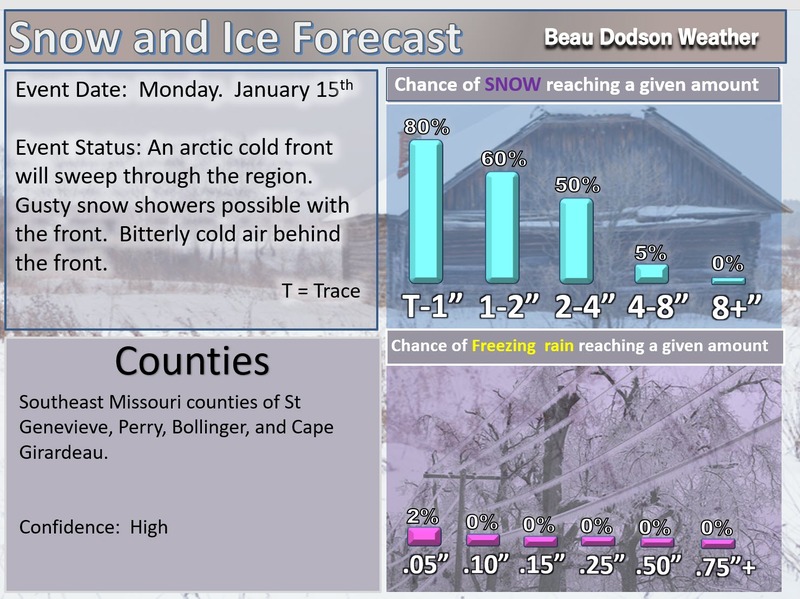 Snow may linger over the Missouri Bootheel and northwest Tennessee. Accumulating snow or ice: Yes, but ending. Total snow accumulation of a dusting to three inches. Winds: North and northwest at 10 to 20 mph. Gusty winds. What impacts are anticipated from the weather? Icy roads possible. 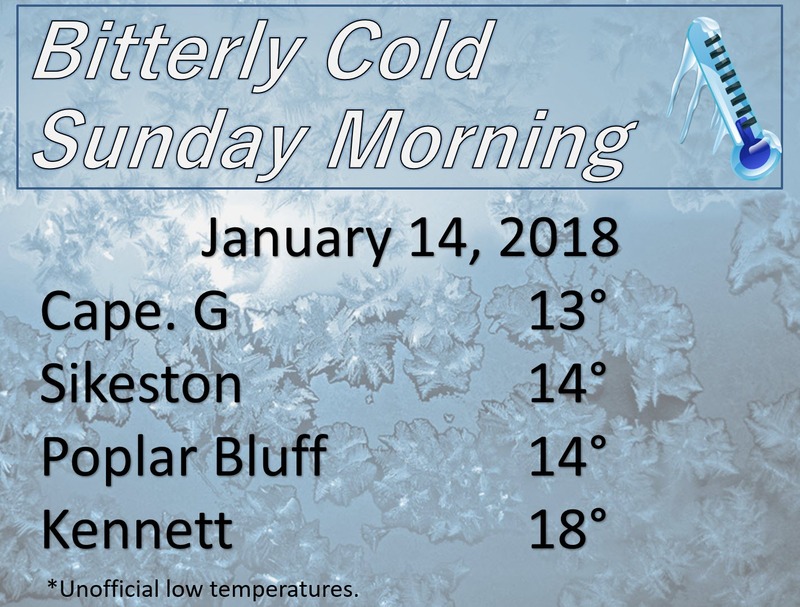 Bitterly cold air. Low wind chill values. 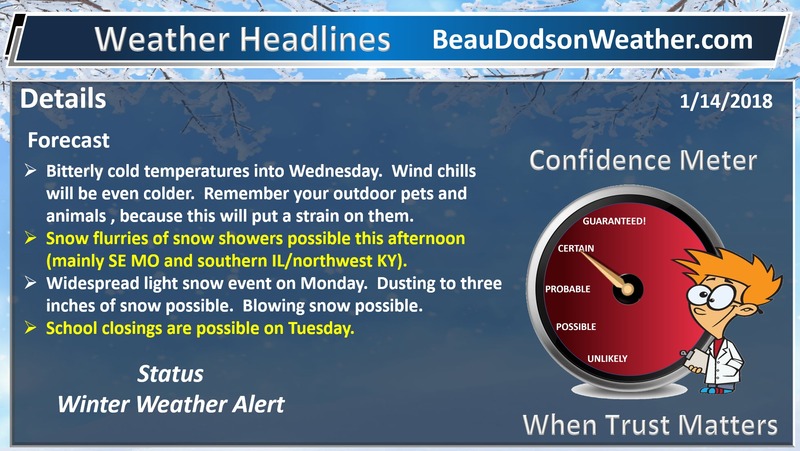 Blowing snow possible. Forecast: Partly cloudy. Bitterly cold. What impacts are anticipated from the weather? Icy roads possible. 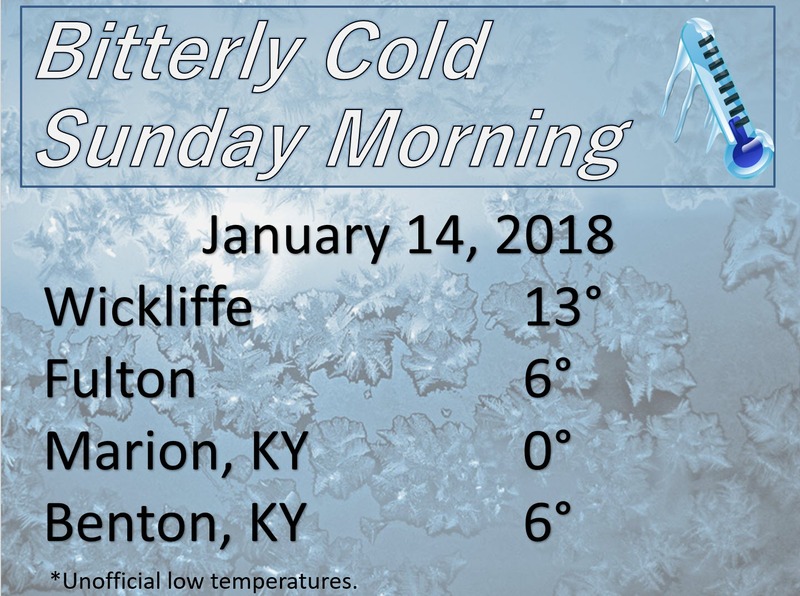 Bitterly cold air. Low wind chill values. Forecast: Mostly clear. Bitterly cold. What impacts are anticipated from the weather? Low wind chill values. Forecast: Some clouds. A slight chance for snow showers. 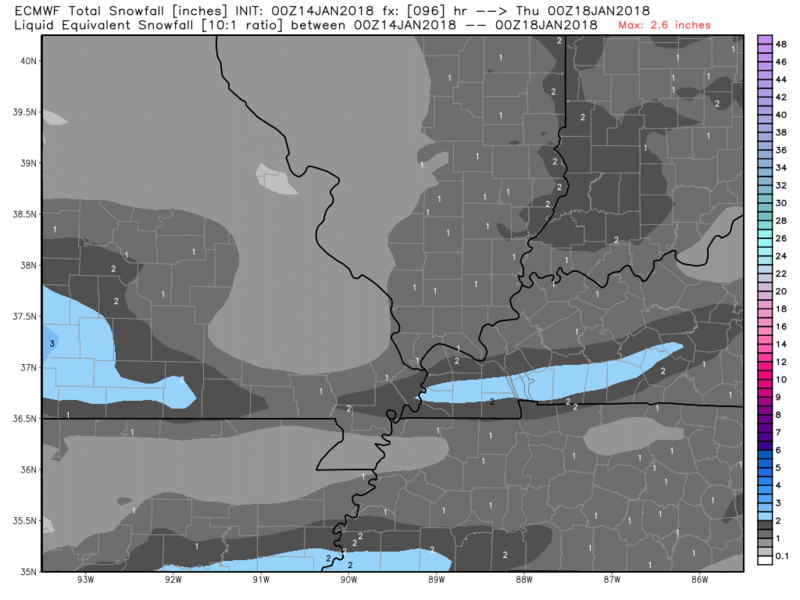 Sunday through Monday night: Flurries or light snow is possible Sunday afternoon across southeast Missouri and mainly the northern half of southern Illinois into northwest Kentucky. Little or no accumulation. Another strong cold front sweeps through the region on Monday and Monday night. A band of gusty snow showers will accompany the front. A dusting to up to three inches of snow possible. Blowing snow possible, as well. Some school closings are likely on Tuesday. 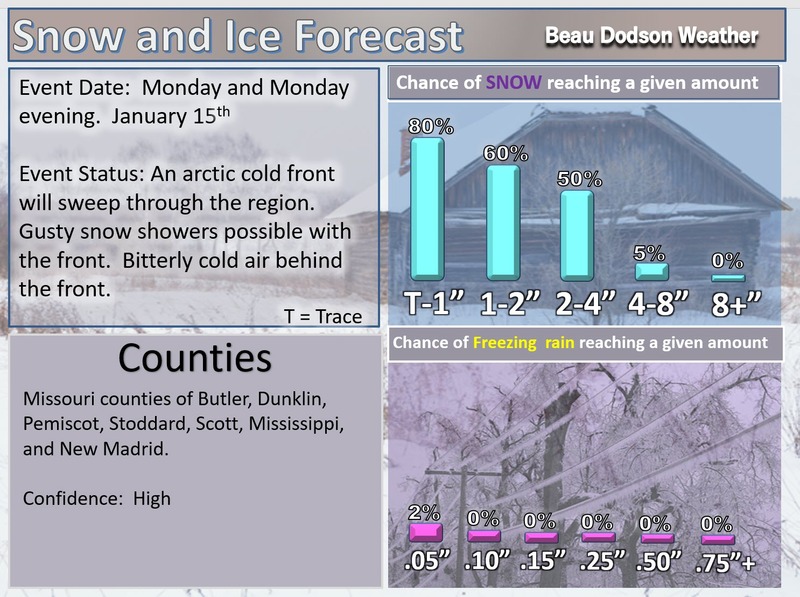 Tuesday through Friday: At this time, winter precipitation appears unlikely. I am watching a weak system on Thursday. The National Weather Service definition of a severe thunderstorm is one that produces quarter size hail or larger, 58 mph winds or greater, and/or a tornado. Now through next Saturday: Severe storms are not anticipated. 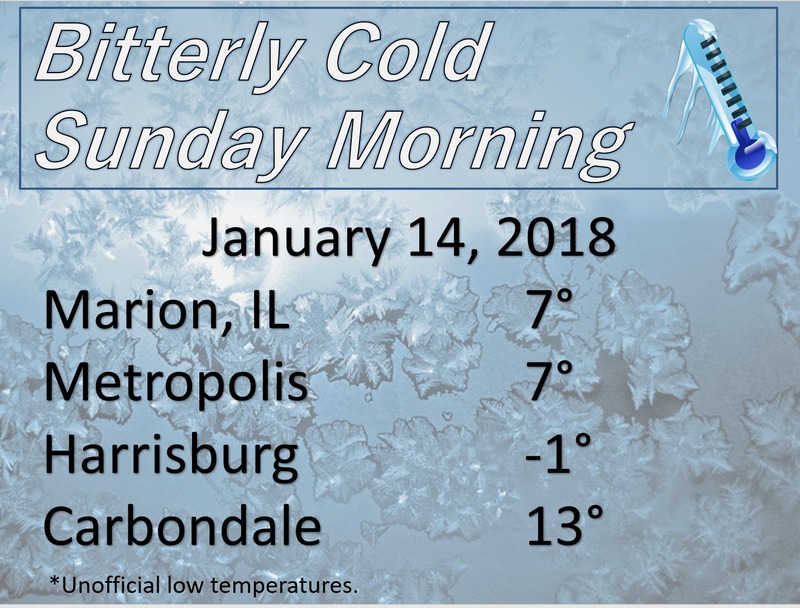 The big story continues to be the bitterly cold temperatures. That will be the story through the upcoming week. 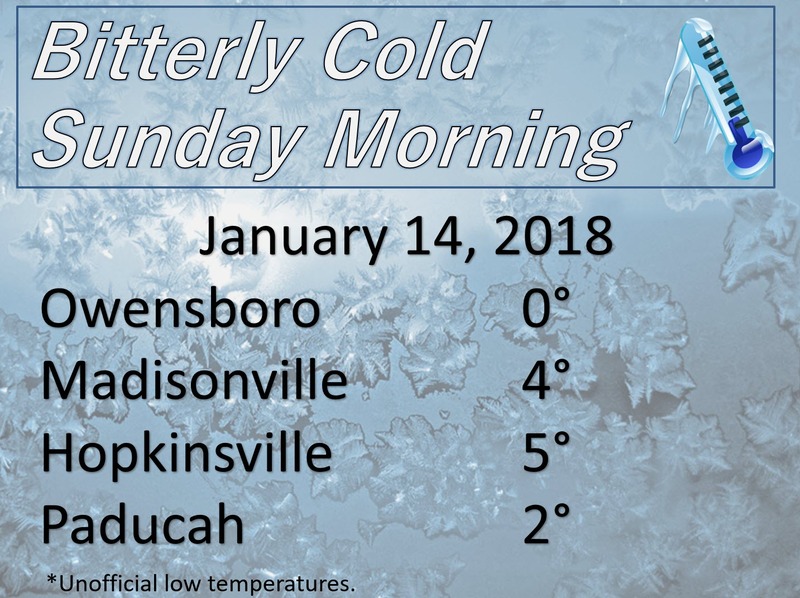 Here are some of the Sunday morning low temperatures. I was a bit too cold in my forecast. Either way, it was cold. A cold front will sweep through the region Monday and Monday afternoon. The front has sped up a bit. At one time it appeared most of the snow would be during the afternoon and evening hours. It now appears that snow showers will approach our northern counties Monday morning and track south and southeast through the day. Gusty winds and falling temperatures will accompany this front. Snow totals should range from a dusting to three inches. 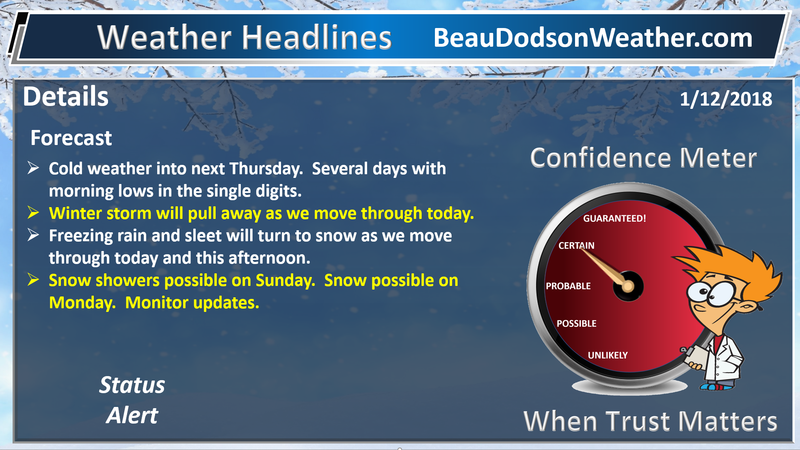 Model guidance is not in agreement as to whether everyone will pick up snow accumulation. I have updated the snow maps (further down in the blog). I increased the probabilities slightly. It is possible that a few locations receive no measurable snow. 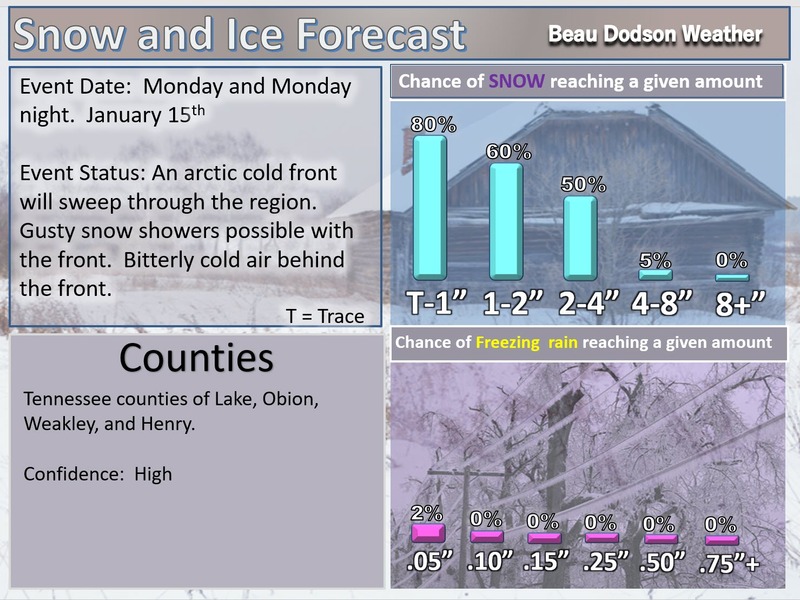 Icy road conditions are possible Monday into Tuesday. I would not be surprised if there will some school closings on Tuesday. Imagine had this past snow happened on a Monday. Some schools would have been out all week. Bitterly cold temperatures and wind chills will accompany the front and that will last into Thursday. 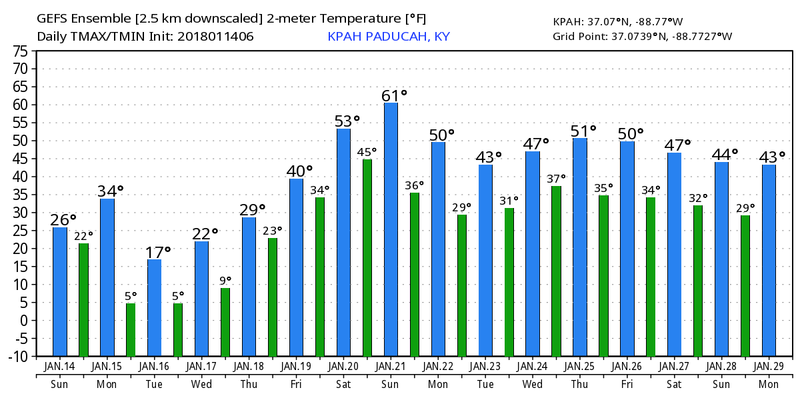 Temperatures Tuesday, Wednesday, and Thursday morning will likely dip into the single digits. A few sub-zero temperatures are also possible. Wind chills values of -15 to 10 above will be the general rule Monday night into Wednesday night. Here is the sixteen day high and low temperature maps from the GFS guidance. Please keep in mind, the model accuracy past day 5 decreases substantially. 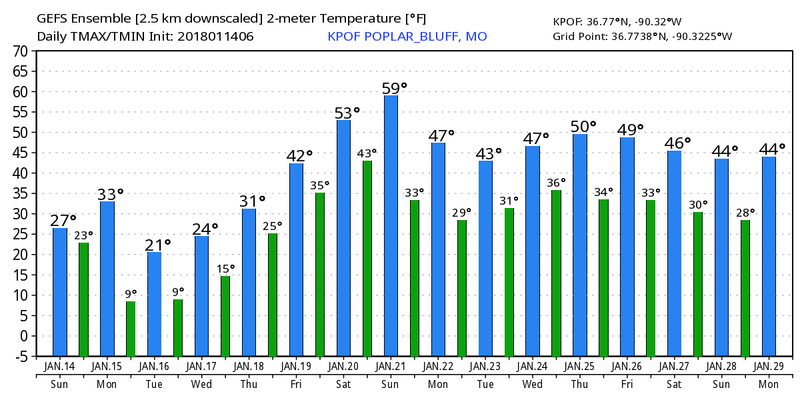 You can get the general idea that it will be cold this week. 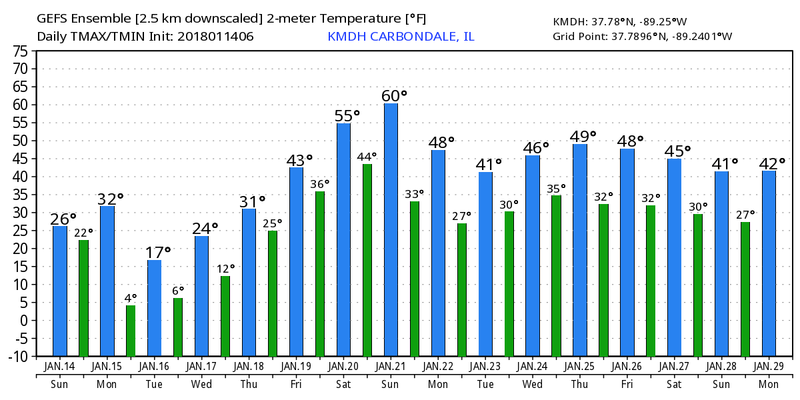 Perhaps somewhat milder as to move into next week. Fingers crossed. We will see a slight warm up by Friday. Highs on Friday will still be below normal, but not as cold as recent days. Highs on Friday may top out in the 30’s! Heat wave. Please remember your outdoor pets. 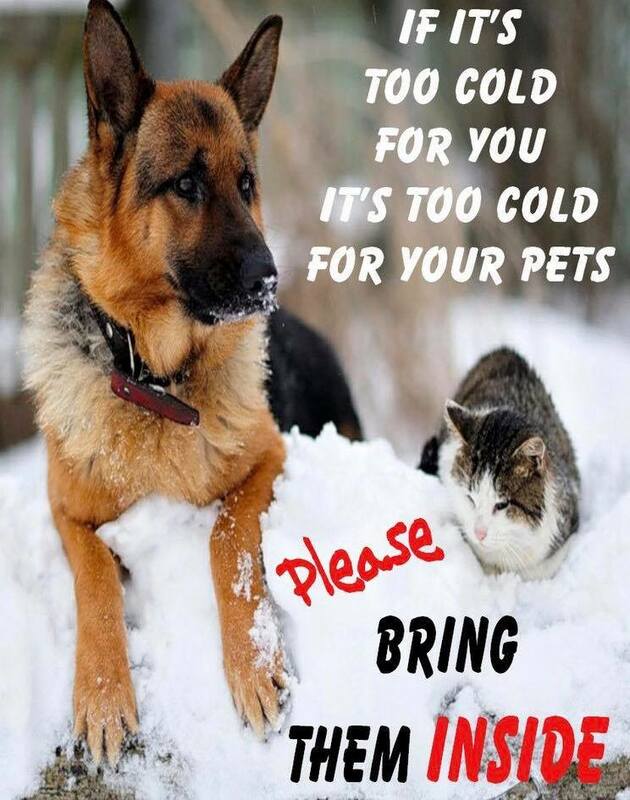 If it is cold for you it is cold for them. Snow will spread across our region from north to south. This is a light snow event. Winter weather advisories are possible, Either way, a dusting to three inches of snow is anticipated. This will cause hazardous road conditions to redevelop. The snow will arrive before 10 am over our northern counties (Farmington, Missouri towards Mt Vernon, Illinois). The snow will spread south and southeast through the morning and afternoon hours. Snow may linger from Poplar Bluff, Missouri, towards Kentucky Lake as we move into the late afternoon or evening hours.. 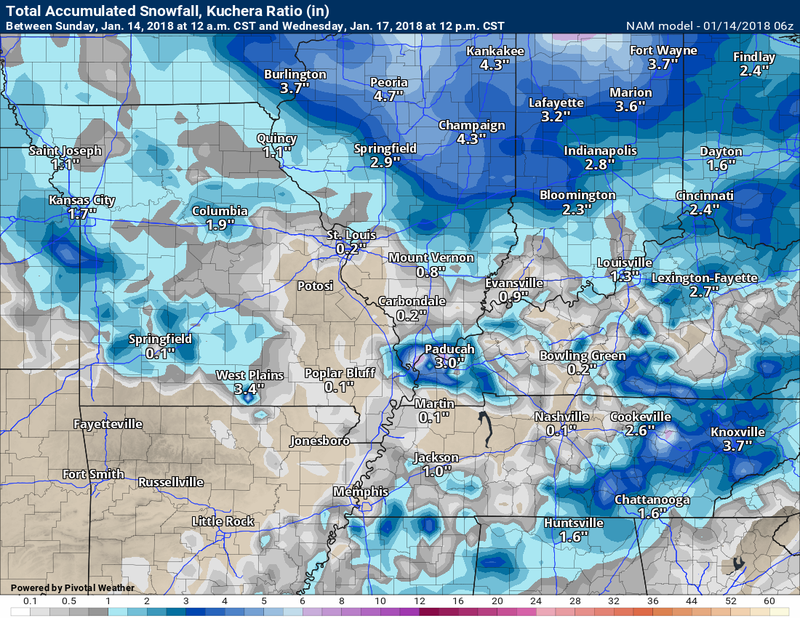 Here is the EC model guidance snow forecast. This is for the Monday event. Here is the NAM, NAM 3KY, and GFS model guidance. Some differences. 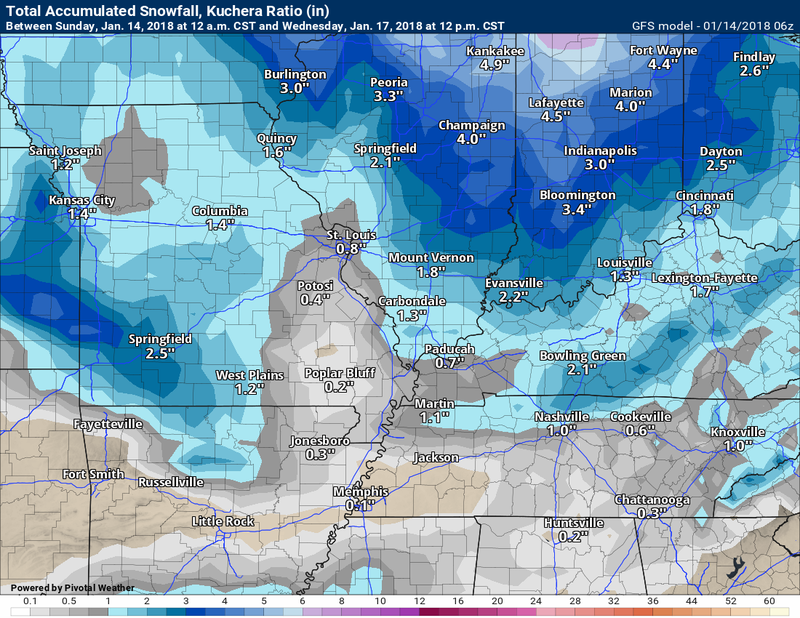 These are the snow forecast totals from the model guidance for Monday and Monday evening. 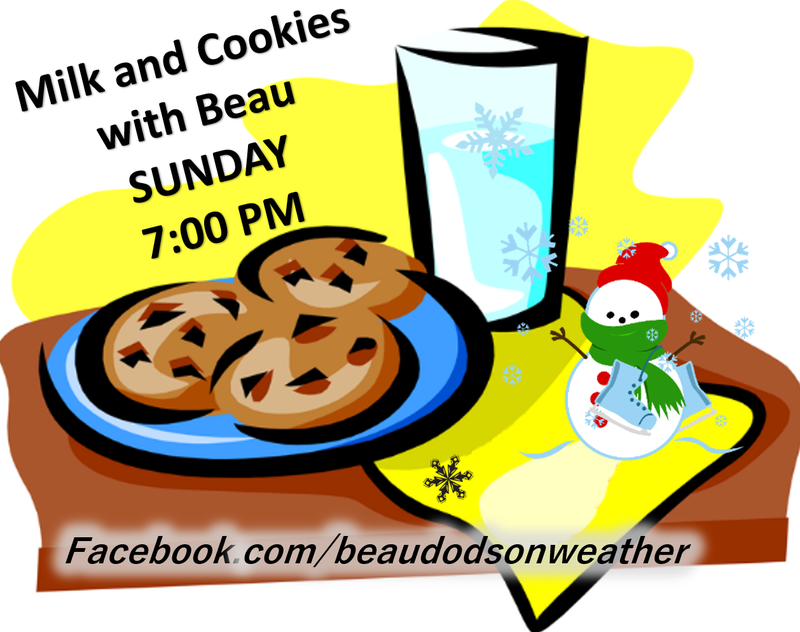 I will be hosting another Mild and Cookies with Beau on Facebook. It will be Sunday evening at 7 PM. A Q&A session concerning our upcoming snow chances. 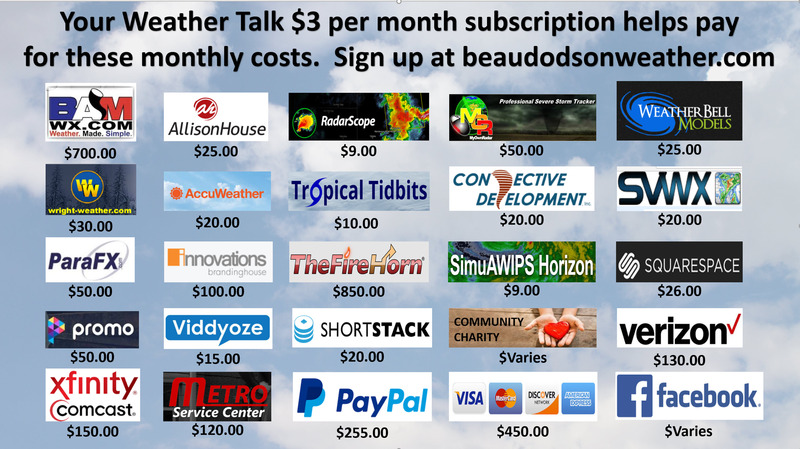 Have you subscribed to Weather Talk? If not, here is your chance! Normal monthly operating costs, for Weather Talk, ranges from $1500 to $2000. If you would like to support this data, then please subscribe. 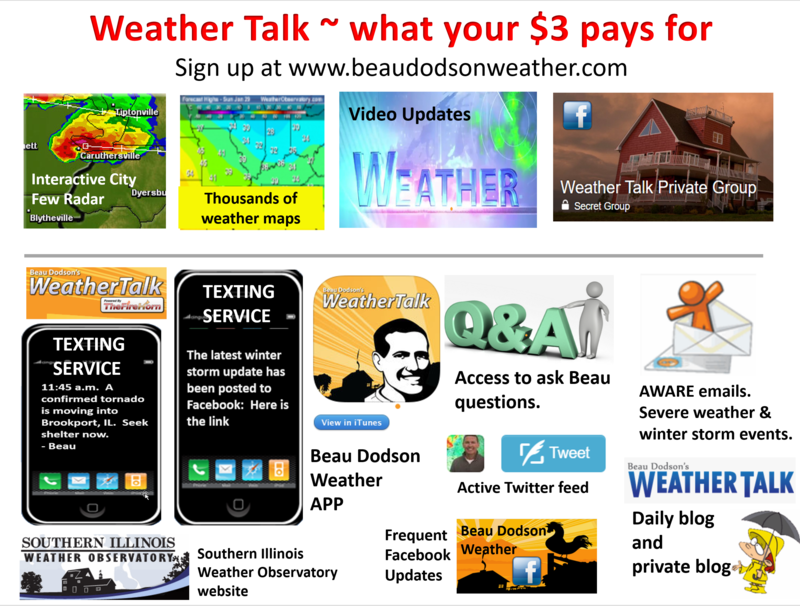 Your $3 a month helps cover the costs of the weather graphics, videos, and my time. 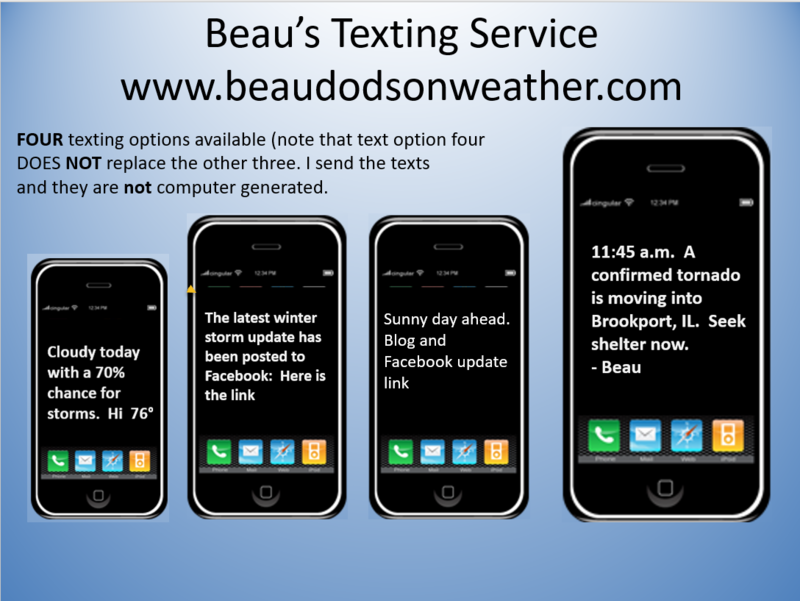 You may choose app/text notifications for my Facebook and blog updates. I will send you a link to the latest updates via the app/text. Once you subscribe you can choose from four different app/text options. Here are the four options. We offer regional radars and local city radars – if a radar does not update then try another one. Occasional browsers need their cache cleared. You may also try restarting your browser. This will usually fix any problems. 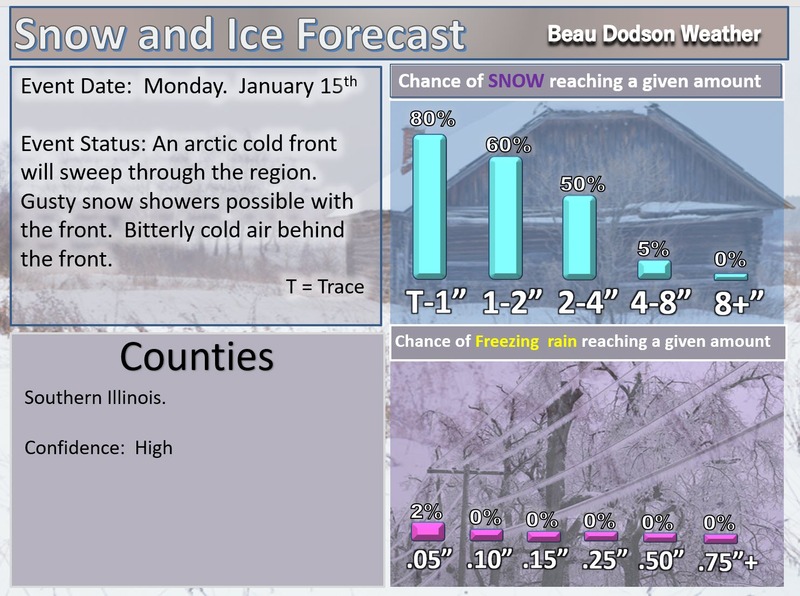 January 13, 2018: Tracking cold and snow. January 15, 2018: Snow and cold.